This sculpture is being displayed on an ongoing rotating basis at various organizations which comprise the Cheyenne Interfaith Council. As that information becomes available it will be posted on this webpage. Presently, this effort is being coordinated by Rev. Rick Veit, John Peacock, and Forrest King to arrange for it being displayed at your faith community. If your community is not yet part of the Cheyenne Interfaith Council then please consider joining us. Requests from non-member organizations and individuals will be considered on a case by case basis. Presently, this effort is being coordinated by Rev. Rick Veit, John Peacock, and Forrest King to arrange for it being displayed at your faith community. Persons representing organizations desiring to join the Cheyenne Interfaith Council should contact either President - Rev. Rodger McDaniel or Vice President - Rabbi Harley Karz-Wagman. 9-11 Remembrance Observance in 2011. There is a lot of symbolism in this “found art” sculpture, which was created in 10 days with no prior knowledge of the items to be used. I tried to remember what each person told me about the objects they presented in bringing these pieces of the whole together. It was more than a little overwhelming. 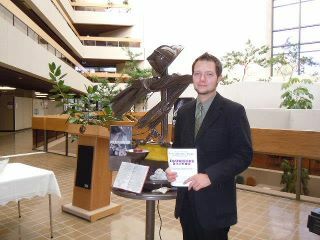 Without the support and assistance of my beloved fiancee' Leah Zegan, I would not have been able to finish the sculpture. She watched the kids and reminded me to eat through those grueling 10 days. Leah also helped with breaking the mirror into pieces, gave a lot of input as to how things should be arranged, and she helped me make many decisions I was indecisive about throughout the creation of the art. I want her to know that I couldn't have done it without her. This sculpture means all the more to me because of what we shared in creating it. In the description below, I've tried to honor each part which now is connected to make a single piece of art. 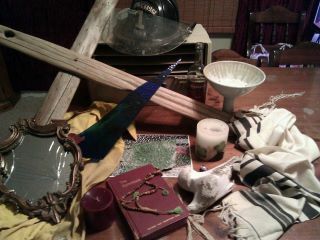 I look at this now as a single piece of art created from the diversity which together we have tried to honor and how to me these individual items fit together to make something meaningful just as all of the faith communities can fit together to make the real masterpiece of diversity without divisiveness, this nation which we cherish and hopefully a more peaceful and just world. The overall appearance is intended to be that as if most of the items were cast together in bronze as a solid, an enduring monument to these intentions described below. Some of the objects would become totally unidentifiable if that actually was done. That is why with some of the objects remain uncoated with the bronze looking over-coat. A "melting pot" creates an alloy where everything looses its distinctiveness in the making of an alloy. Sometimes an alloy is stronger, but it can also be weaker. The beauty of our nation is that it is "a mosaic" and not just a "melting pot." A mosaic requires of us preservation of the distinctiveness of each piece in comprising the whole or else much beauty and meaning is lost. We respect and honor diversity and distinctiveness. Love of country does not demand "lock-stepped uniformity" or "lowest common denominator conformity." There are times such as this when we all come together like bronze, and even then, do so in a way which honors the variety of cultures, faiths, traditions, and communities we as individuals reflect in this sculpture and our national mosaic of democracy. May we be a strong alloy in being resolute in standing together for the values we share and yet remain a beautiful mosaic of respect for the diversity which distinguishes each community that comprises our efforts. In the front, a Presbyterian Hymnal is open to two songs, “My Country tis of thee” and “America the Beautiful”. This symbolizes the fact that despite our religious differences, we are still Americans and we love our country. Behind the hymnal stands a Chalice, the symbol of the Unitarian Universalist tradition. This represents unity of all faiths and worldviews. Inside the Chalice walls are small pieces of mirror surrounding a Peace Candle. The longer you burn the candle of peace, the brighter it becomes. To the left, there is a panel that reads “Remember”. The twin towers burn, and beneath it we see the mothers of fallen firefighters mourning their loss. In front of this panel are Muslim Prayer beads, broken apart from one another and representing the brokenness of the religion in the midst of 9/11. This is meant to remember not only the twin towers tragedy, but all war and pain caused in the name of religion. "we need to be strong as we heal from our past and look to the future…" On the right another panel reads “Heal”. Above a woman prays, and below thousands gather with candles to mourn. Standing tall on the center-left of the "Cross" is a panel that says “Hope”. Beneath is a Muslim woman with the American flag painted on her face, representing that American Muslims are as patriotic as other Americans and love this country. Another Muslim woman has a peace sign on her cheek. Surrounding the women are leaders from many faiths, from Catholicism to Buddhism. Above, children’s hands of every race hold up the Earth. Hope lies with our world religions living in unity, and a peaceful future lies with our children. The centerpiece of the memorial is a bronze-like arrangement of a Christian Cross, Jewish "Tallit (Prayer Shawl)" and an unbroken set of Muslim Prayer beads. To me, as combined in this sculpture, these three symbols represent the unity of the 3 major Abrahamic Religions that must unite for peace. Atop the arrangement hangs a firefighter’s helmet, reminding us that brave men and women from every major faith tradition died that terrible day, trying to save lives. From below the centerpiece "light" emanates from clear, colorless, shards of shattered glass in the top of the "EMT's Jump Box" illuminating the upper portions of the sculpture reflecting the grace which blesses us when people of diverse backgrounds come together willing to put their lives on the line to protect ours. At the base is an "EMT's Jump Box", whose shelves were used to make the panels. This honors the first responder EMT’s we lost that day, one in particular that was Muslim, Mohammad Salman Hamdani. One like this was found near his remains at "Ground Zero." It was how he was initially identified until that could be confirmed by other forensic methods. Bordered by the frame from the "Broken Mirror", the front of the "Jump Box" is adorned with a panel which has the word "Coexist" written in a font that is comprised of various faith symbols. I didn't design that design, but it really seemed to fit here. While the original "Star of life"
symbol instead because while the original use of the "EMT's Jump Box" was to carry medications and supplies to help sick and injured people, now as part of this sculpture it symbolically carries and supports our aspirations for healing from the schisms exacerbated by the events of September 11, 2001 and now contains the "light" of our shared hopes for a more peaceful future. In front of is some of the cloth from a fire fighter's shirt, a piece of fire resistant fabric which was made to wrap in protection the fire fighter who wears it, not unlike a "prayer shawl" wraps a person so he or she may be immersed in his or her devotions, undistracted by the outside world during personal meditations. Remember history, Heal from our past, and Hope for a peaceful future." It would be an impossible task to expect the artist to remember every word which ever person spoke as each object was presented to him. His description of "the whole" and reflections on how he interpreted the way each of the parts came together is a beautiful tribute to the shared intents of the sculpture, the events, this organization, and all who participated. The sculpture he made was received with as much appreciation as can be expressed. The following are some of the words, from some of the people who donated some of the objects. which explain some of the objects, as we have been able to collect them. "The Islamic Center of Cheyenne donated a string of broken prayer beads. These beads represent a break within our religion in which some groups have become radicalized and broken from the peaceful tradition of Islam. We hope and pray for a time when all Muslims can unite again and exemplify the true spirit of Islam which is peace." Two "candles" and a "chalice" which when combined form the "Flaming Chalice" were presented by the Unitarian Universalist Church of Cheyenne. "The Unitarian Universalist Church of Cheyenne donated a chalice and a candle which is our symbol of the "Flaming Chalice" our primary symbol of truth, faith, hope, and love. lists it as coming from "Community of Christ." Help with getting accurate information is appreciated. Thanks. The Southeast Wyoming Islamic Center presented an intact set of prayer beads. A "tallit" (Prayer Shawl) was presented by Rabbi Harley Karz-Wagman of Mt. Sinai Synagogue. We don't have the Rabbi's explanation, but below is a poetic rendering written by a member of Mt. Sinai Synagogue about some of the meanings of this object and why it was given to become part of the sculpture. A tallit is a garment combining fringes and knots to represent the 613 Mitzvot (teachings) our creator has taught us in the Torah. During the days of our lives and on the evening of Yom Kippur when stand before our maker, we wear a tallit. When we are married we stand beneath the tallit as a symbol of our home we will build together. When baby boys enter B'rit Milah, "the Covenant of of the Cut" on their eighth day of life, they are swaddled in a tallit. When our life ends, we are buried in our tallit. When we do this, we remove one corner of fringe and knots, nullifying it as a ritual object and rendering it an object of comfort to honor our deceased's life of faith. We offer this tallit, a corner of fringe and knots we now remove, nullifying it as a ritual object and making an object of comfort to honor all of those who we remember who lost their lives a decade ago today and say, `May you be comforted among the mourners of Zion.' "
The following secular objects were donated retired Fire Chief, Firefighter, Paramedic - Jason Bloomberg MD in memory and honor of all of the emergency services workers who with their actions demonstrate their "love of thy neighbor" every day they are working to serve the public's safety, especially those who died or were injured in the line of duty on September 11, 2001: a Nomex Fire Shirt, a leather Fire Helmut, and a broken EMT's Jump Box. September 11, 2011 - 10th Anniversary in Remembrance of 9/11 Observance The theme of the Cheyenne Interfaith Council Observance is “Remembrance, Healing, and Hope." On the 11th, there will be a presentation by Hands in Harmony starting at 2:45 PM at the Capitol. The Interfaith Service will begin at 3:00 PM with a program that includes music, readings from the Quran, Hebrew Bible, Gospel, Greek Orthodox, and other traditions ... Each faith community is asked to bring a meaningful “broken” item to the September 11th commemoration. All broken items will be brought forward and used by a local artist, Forest King, to create a work of art symbolizing the transition from brokenness to hope. Please arrive by 2:30 PM to assure your ability to be present. Participants in the Interfaith Service should be there by no later than 2:15 PM to prepare for their parts. Thank you. This segment runs 52 seconds. From Mt. Sinai Synagogue -- (Rabbi Harley Karz-Wagman presented a "Tallit" which is a Jewish Prayer Shawl). Jason Bloomberg, who spent 20 years as an emergency responder (Firefighter - Paramedic before entering medical school), brought an EMT's jump kit (in remembrance of the one) found at Ground Zero (that belonged to Mohamed Salman Hamdani who died there while rescuing others) as well as a fire fighter's shirt and a firefighter's helmet in remembrance of other emergency personnel who died or were injured while rescuing others there. Photo and text by: Michael Shay adapted from his Blog Hummingbirdminds posted 9-11-2011. This film runs about 50 minutes. Disclaimer: The HBO Documentary Films: Beyond 9/11 - Portraits of Resilience was produced by HBO and TIME, and does not reflect any official position or endorsement by the Cheyenne Interfaith Council. It was placed here solely at the discretion of the webmaster because of its focus on reflections by survivors of the events of 9-11-2001. Because finding or making peace can be enhanced by increasing understanding between peoples in conflict, the next two embedded videos are offered with the hope of improving understanding, but also with the same caveat as the HBO Documentary above. The following originally comes from TED (Technology, Entertainment, and Design). That organization sponsored a remarkable discussion between the mother of one of the victims of 9-11 and a mother of one of the conspirators of 9-11. The encounter is both disturbing and inspiring on many levels. I can't imagine what it is like actually walking in either of these women's shoes, but I can see what I might learn from what they are sharing with the hope that knowledge will lead to greater peace in the this world. - Webmaster. This segment runs about 10 minutes. The following is a video from the Google S/A/V/E (Summit Against Violent Extremism). This segment runs about 27 minutes. Along these same lines, we as a nation need to examine how the events of 9-11-2001 and their impact on our stated values as expressed in our most cherished national documents. This in essence is the theme of Divided We Fall. This movie trailer runs about 7 minutes. Tuesday, September 13, 2011 Just the Facts Please: National and regional experts on the Affordable Care Act present the law in bite-­size pieces and answer your questions. Featuring a keynote address by T.R. Reid, best-­selling author of The Healing of America: A Global Quest for Better, Cheaper and Fairer Health Care. Registration is $25 and includes lunch. For more information, to register or to become a sponsor or exhibitor, visit www.OneHealthVoice.com or contact LRosedahl@pubaffairsco.com or see the linked Flier While this is not a Cheyenne Interfaith Council event, it fits as a "Day 5" Days of Peace topic taking place in our state of interest to anyone with questions or concerns about health care delivery in the United States under existing law. Wednesday, September 14 - 7 PM at Mt. Sinai Synagogue - Presentation by Mohamed Salih of the Southeast Wyoming Islamic Center and Rabbi Harley Karz-Wagman: speaking together about "How Islamic and Jewish Prayers Lead to Peace." This is a Mt. Sinai Days of Peace Event. The public is welcome and invited to this event. Afterwards a reception will be held featuring some treats prepared by the Islamic and Jewish Communities. Friday, September 16, 20117 - PM at Mt. Sinai Synagogue - Shabbat Evening Services led by Rabbi Harley Karz-Wagman with Guest speaker will be Rev. Dana Lightsey, Unitarian Universalist Church of Cheyenne - This is a Mt. Sinai Days of Peace Event. The public is welcome and invited to this event. Afterwards a traditional Oneg Shabbat (reception) will be held featuring some treats prepared by the Mt. Sinai Sisterhood. It is not necessary to have attended the prior sessions to attend this or any of the upcoming sessions. Sunday September 18th, Highlands United Presbyterian Church is participating in "11 Days of Peace" with a special program entitled "What Christians Need to Know About Muslims in a Post 9/11 World." Mohamed Salih of the Southeast Wyoming Islamic Center will join Rev. Rodger McDaniel for a dialogue about Christian-Muslim relations. The public is invited and encouraged to bring questions. The service begins at 10 AM. Observance in Cheyenne ( Information Updated as of 9-19-2011 Because the body of former US Senator Malcolm Wallop will be lying in state in the rotunda of the Capitol Building Wednesday morning, the CIC Day of Peace celebration will be moved to the Herschler Building atrium. The time is unchanged and the ceremony will begin at noon. Please plan to attend and circulate this change.) - Interfaith Service originally planned to be held the rotunda of the Capitol will instead be held in the atrium (area which is down the first set of stairs in the entry to the building). of the Herschler Building starting at noon on 9-21-2011. Please check back for further updates, if any, as they develop. The International Day of Peace is the last part of an event that began with a 9/11 Observance on Sunday, September 11. Governor Mead has just signed a Proclamation that will be read designating September 21 as the International Day of Peace in Wyoming. "Click" on image for larger view. Local artist Forrest King will also be presenting a sculpture that he has made using the presented symbols from different faith communities that were brought to the 9/11 Observance. There will be a short presentation regarding peace from the Muslim, Christian, Jewish, and Unitarian Universalist Communities in Cheyenne. Please see attached flier for further details. Press Release. Wyoming Gov. Matt Mead penned a proclamation marking Sept. 21 at the International Day of Peace. At today's lunchtime ceremony at the Herschler Building honoring this day of peace, the Rev. Rodger McDaniel read the proclamation because the Gov was busy with the events for the late U.S. Sen Malcolm Wallop. Photo and text by: Michael Shay adapted from his Blog Hummingbirdminds posted 9-21-2011. Un-credited photos on this page either are from Jason Bloomberg MD or from a source which could not be otherwise identified.